This article is about the modern municipality. For the historic farming site, see Banaue Rice Terraces. Banaue (or alternatively spelled as Banawe), officially the Municipality of Banaue is a 4th class municipality in the province of Ifugao, Philippines. According to the 2015 census, it has a population of 21,837 people. It is widely known as the site of the UNESCO World Heritage Site, the Batad Rice Terraces and Bangaan Rice Terraces. In the 2015 census, the population of Banaue was 21,837 people, with a density of 110 inhabitants per square kilometre or 280 inhabitants per square mile. Sometimes called by locals as the "Eighth Wonder of the World", the Ifugao Rice Terraces begin at the base of the mountain range and extend several thousand feet upwards. Two of the terrace clusters in Banaue, namely Bangaan and Batad, are part of the UNESCO World Heritage inscription. It is said that their length, if put end to end, would encircle half of the globe. The terraces are believed by many to be more than 2,000 years old as postulated by early Philippine anthropologist Otley Beyer, recent studies by carbon dating however contends this and instead the structures may be less than 1,000 years old. The rice terraces manifest the engineering skill and ingenuity of the sturdy Ifugaos. They are irrigated by means of mountain streams and springs that have been tapped and channelled into canals that run downhill through the rice terraces. The rice terraces once stretched north-east to Cagayan and as far south as Quezon. However they are now slowly being abandoned and showing signs of deterioration. The 1990 Luzon earthquake damaged some of the terraces' irrigation systems, while El Niño triggered droughts that led giant earthworms to erode the terraces' soil. Furthermore, the rice variety most suited to the area's cool climate is not a high-yielding crop; because it takes so long to mature, some Ifugao families have abandoned their land in the rice terraces in favour of land that reaps faster rewards. An Ifugao Terraces Commission was created in 1994 and was superseded by the Banaue Rice Terraces task force, which was closed in 2002. UNESCO has listed the Batad Rice Terraces and Bangaan Rice Terraces as a World Heritage Site since 1995, under the designation, Rice Terraces of the Philippine Cordilleras. All located in the Ifugao region, the Rice Terraces also feature as one of the Globally Important Agricultural Heritage Sites or GIAHS. They are supported by indigenous knowledge management of muyong, a private forest that caps each terrace cluster. The muyong is managed through a collective effort and under traditional tribal practices. The communally managed forestry area on top of the terraces contains about 264 indigenous plant species, mostly endemic to the region. The terraces form unique clusters of microwatersheds and are part of the whole mountain ecology. They serve as a rainwater filtration system and are saturated with irrigation water all year round. A biorhythm technology, in which cultural activities are harmonised with the rhythm of climate and hydrology management, has enabled farmers to grow rice at over 1 000 metres. Contrary to popular notion, the Banaue Rice Terraces as seen from the viewpoint[where?] are not included in the UNESCO inscription, due to the presence of numerous modern structures. However, it is a National Cultural Treasure under the Ifugao Rice Terraces. The Banaue Rice Terraces were chosen as one of the two green globe destinations of the country by the World Travel and Tour Council. It received an “International Historic Engineering Landmark Award” from the American Society of Civil Engineers. It was also acknowledged by the World Travel and Tour Council as a green globe destination in the Philippines. The stone walled rice terraces were built by means of early tools and methods in order to maximise the use of land space, They exceed the height of the world’s tallest building if the vertical distance between top and bottom row are measured. 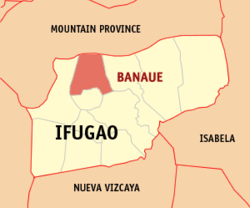 ^ a b "Province: Ifugao". PSGC Interactive. Quezon City, Philippines: Philippine Statistics Authority. Retrieved 12 November 2016. ^ a b c d Census of Population (2015). "Cordillera Administrative Region (CAR)". Total Population by Province, City, Municipality and Barangay. PSA. Retrieved 20 June 2016. 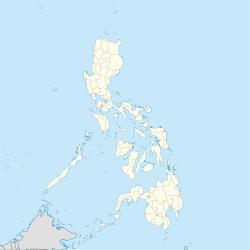 ^ "Province of Ifugao". Municipality Population Data. Local Water Utilities Administration Research Division. Retrieved 17 December 2016. ^ Cabreza, Vincent (July 15, 2013). "For Ifugao rice terraces, age should not matter". Inquirer.net. Retrieved 29 January 2018. ^ "Ifugao Rice Terraces may be younger than we think". Rappler. April 29, 2015. Retrieved 29 January 2018. ^ Rice Terraces of the Philippine Cordilleras, UNESCO World Heritage Site. ^ a b Banaue, e-philippines. ^ "Banaue, Philippines: Average Temperatures and Rainfall". World Weather Online. Retrieved 15 September 2014. 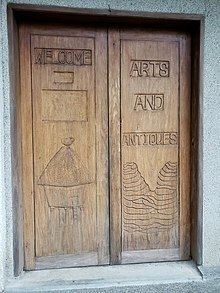 Wikimedia Commons has media related to Banaue, Ifugao. 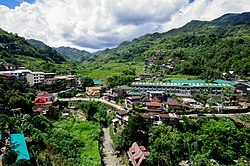 Wikivoyage has a travel guide for Banaue.